DA Microfiber Discs are available in cutting and finishing discs. Their engineered foam interface offers controlled conformability. The microfiber cutting discs are gentle on the paint and do a fantastic job of evenly distributing DA Microfiber Correction Compound and letting the abrasives do their job. The result is smooth paint with no swirls! Meguiars DA Microfiber Finishing Discs are made for maximum efficiency. As you move the polisher over the paint, the microfibers adapt to the curves and contours of the paint, distributing the wax and mild cleaners evenly for maximum protection and gloss. Purchase each part of the Meguiars DA Microfiber Correction System separately or get ready-to-use kits already prepackaged for your convenience. 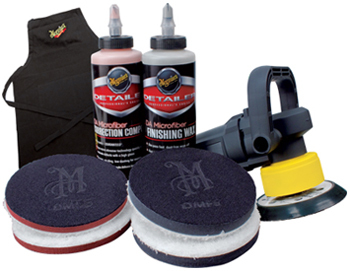 Meguiars DA Microfiber Correction System revolutionizes defect removal and surface finishing with no swirls - guaranteed!